The Supreme Court Ruling Monday in Harris v. Quinn played second fiddle to the ruling in the Hobby Lobby case in the media. While the Hobby Lobby contraceptive case was front page news in the New York Times, Harris v. Quinn didn't get a mention until page 12. The Harris case dealt with a few home health care workers insistence that they not be required to pay fees to their union. In 1977 the Court's ruling in Abood v. Detroit Board of Education established that public employees who benefit from the services of a union, such as collective bargaining agreements that improve their working conditions and salaries, must pay their "fair share" for such services even if they choose not to belong to the union. This "fair share" is typically known as an agency fee. The Supreme Court struck down the 1977 law as it applies to these workers, citing their first amendment rights. According to the New York Times, "Justice Alito wrote that home health care workers who typically work for an ill or disabled person should be classified as partial public employees and should not be treated the same way as public schoolteachers..."
At first blush the ruling may appear to be a victory of sorts for teachers unions. Anti-labor groups were hoping the Court would strike down the 1977 Abood ruling in its entirety, crippling all public employee unions by greatly reducing its membership and treasuries. The Court stopped short of this and specifically said the ruling did not apply to public schoolteachers. All of us in public education should hold off on our rejoicing, however. While this ruling did not specifically apply to schoolteachers, a close reading (pun intended) of the majority opinion crafted by Alito shows that the Court has clearly set the stage for some persons or group to bring suit against teachers unions. In his majority opinion Alito wrote, "Agency-fee provisions unquestionably impose a heavy burden on the First Amendment interests of objecting employees." As Nina Totenberg said on NPR yesterday, "The court has set up the legal goal posts and invited those opposed to public employee unions to kick the ball through." It appears to be just a matter of time until this week's court ruling is applied to public school employees. This is an issue of concern for all public school teachers whether you belong to a union or not. We are living in an anti-labor era. 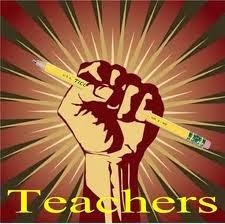 An attack against teacher unions is an attack against the teaching profession. Whether you belong to the union or not and whether you agree with some union positions or not, the health and well-being of the teacher unions is critical to you being able to continue to practice your profession, to be reasonably compensated, to have reasonable job protections and reasonable working conditions. I began my career as a teacher in Pennsylvania before teachers had collective bargaining rights. At the time, I was earning $6300 dollars a year, plus $400 for coaching the basketball team. I taught six classes a day and had two preparation periods a week. My largest class had 39 students and my average class size was 33. In the spring, the temperature in my 100 year-old third floor classroom hovered around 98 degrees. In 1970, one-year into my career, teachers won the right to collectively bargain. Concerned with the conditions I and my colleagues were working under, I joined the negotiations team. In one memorable exchange at the bargaining table, I was arguing for a class size limit of 30 students. A member of the Board's team had been consistently insistent that such things as class size were a "management prerogative" and not subject to bargaining. As I presented my proposal he became red in the face, leaned across the table, poked his finger within an inch of my nose and said, "I went to Catholic school and we had 67 kids in my first grade class and I turned out all right." I resisted saying to him that the fact that he was attempting to bully a teacher/negotiator might indicate that he had not turned out all right after all. Eventually an arbitrator ruled that we could bargain working conditions like class size. Over those early years of contentious bargaining teacher salaries slowly rose, but even better, working conditions improved. We won daily preparation times, smaller class sizes and I even got an air conditioner in my room. Most importantly I was working in conditions that made for better teaching and improved student learning. Our teacher unions are not perfect, note the support for the Common Core and the acceptance of Gates money, but a few disagreements in policy is no reason to take your chalk and lesson plans and run away. It is only through concerted, coordinated unified efforts that teachers have won the rights they currently enjoy. It is only through concerted, coordinated unified efforts that we will be able fight off the current round of attacks on our profession. If you do not agree with some of the positions of your union, work for change from within. In the meantime, support your union and your union leadership in every way you in good conscience can. There is no question that the corporate education reformers, the big money plutocrats and the anti-union forces are coming after teachers. They know the best way to do this is to divide and conquer. Political leaders on both sides of the aisles have shown their disdain for us. Remember when politicians attack teacher unions they are attacking teachers. Now is a critical time to put aside petty differences and join in solidarity with fellow professionals and repeat the words of the great Pete Seeger, "You can't stop me I'm stickin' to the union."